The 3M Tora 71501-00001M Protective Glasses with 3D base curved lens offer outstanding peripheral vision and optimal lateral side protection (Optical Class 1). Max comfort improved by contained weight to only 22 g.
Supplied with adjustable and detachable neck cord for security and convenience. The amber coloured lens increase the contrast in low light conditions. The sealed design offers excellent protection against liquids, dust, gases and vapours. The polycarbonate lens has a scratch-resistant coating, increasing its durability. It is also anti fog and anti mist. It has a strong polycarbonate lens to enhance its impact resistance, give you protection with clear vision. 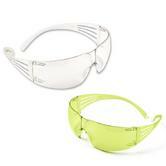 3M Sealed 2890S Clear Lens Safety Goggles complies with EN 166 2C- 1.2.3M1.K.N.BT.9 & EN170 Safety Standards. Soft PVC crystal frame goggles with a wide support area all around the face to enhance comfort. Specific channel on the side of the 3M Fahrenheit frame to accommodate the temple of prescription frames. 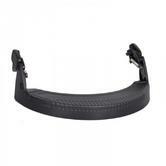 Nylon elastic strap which is easily adjustable thanks to a buckle system and to a pivoting strap attachment mechanism. 3M Fahrenheit 71360-00001 Aerodynamic shape with cylindrical lens for 180° of distortion free vision. Indirect ventilation system to protect against liquid droplets and large dust particles. Model fits well with prescription glasses. Anti-Scratch coating for increased durability. The non-vented version also provides protection against gas and fumes. The 3M V5 Face Shield System is designed for best compatibility with, 3M G3000 and G22 Safety helmet. Full adjustability, up\down in 3 positions. Adjustable ratchet harness, 8 adjustable positions. Ventilation channels for improved cooling efficiency. Can be used in conjunction with 3M integrated eyewear. 3M Removable / Peel Off protective film for 3M HT-400 Visor with QSR coupling and 3M vision headgear. Easy to apply with two self-adesive strips. Easy to peel off by the side tab. 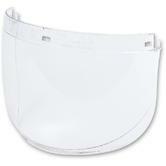 The Visor Cover fits over the standard visor and protects it from scratching or overspray of paint and chemicals. This will extend the lifetime of your 3M visor. 3M 4002226-OP made to fit for all HT-400 series with QSR coupling and 3M vision headgear. This Speedglas 9100FX Visor Plate is designed for use with the 3M Speedglas 9100FX Welding Helmet. The polycarbonate face shield 5F-1 (for the V5 shield carrier) guarantees protection against high speed particles up to 190m/s. It is scratch resistant and anti-fog treated on both sides for the optimal view. The V5 Face Shields unique curved shape provides improved protection both from the front and the sides. The new “Snap-in” feature makes it quick and easy to combine the face shield to the face shield holder. This fragrance-free, low-alcohol face seal cleaner removes any grease or dirt from respirator face seals. Suitable for use on negative and positive pressure respirators. 10 pack of replacement outer protection plates/flexible visor screens for 3M Speedglas 9000 series and FlexView Systems. 3m speedglas 9000 outer protection plate. Outer protection plates/flexible visor screens. The integrated eyewear which fit closely to the wearer's cheeks. Easy to attach to the headband of 3M Safety helmets and provide excellent protection from particles, dust and so on. The glasses to slides easily between the helmet shell and headband. Durable lens coating which will minimize physical and chemical damage. The M-957 / L-115 Comfort Pad can be used on any 3M Versaflo M-Series Headgear, 3M L-Series Headgear, H-Series Hood, and Whitecap Helmets. It attaches to the headband in the area of the users forehead. The 3M Solus lens curve has been designed and manufactured to optimise the fitting, field of vision and coverage of the eyes for more protection. Lightweight glasses, Soft inner padding of the temple for extra comfort. Anti-scratch and anti-fog coating for improved vision and increased durability. 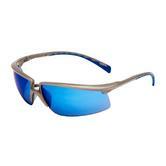 3M Solus Safety Glasses 71505-00009 blue mirror lens are elegant and lightweight, conforms to: EN 166:2001 standard. Tinted lenses protect against sun glare in accordance with EN 172:1994. Self-adjusting feature eliminates using of multiple frame sizes, 3M Pressure Diffusion Technology allows temples to naturally adjust to individual head sizes. Stylish and lightweight design, secure, snug fit keeps eyewear in place without slippage even when the person is in motion. The snug fit also keeps the glasses securely in place as the wearer looks up and down or side to side. Polycarbonate lenses absorb 99.9% UVA and UVB up to 380 nm and meet the requirements of EN 166:2001 standard. 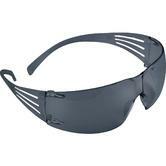 The 3M Tora safety glasses is probably the best value branded safety eyewear on the market, with anti fog features as well as complying with En 166. The 3M Securefit range of wraparound safety glasses come in a raneg of lenses for bright light, low light and regular daylight - so you have the choice of optimal eye protection from debris as well as UV. 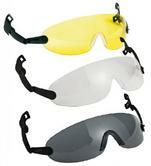 Consider the 3M 2890 series of vented or sealed 3M safety goggles. The 3M eye protection range extends to visors, face shields and the popular 3M Speedglas 100 welding helmets and the 3M Optrel Twisty welding helmet/red head tops.